When I was nine years old, I discovered fishing and pursued it relentlessly. My uncle took me fishing and taught me all kinds if things about chasing trout and bass in freshwater. Then, the summer I turned twelve, he bought a 17’ center console and took me fishing on the saltwater for the first time. A great day of catching Bluefish on the water. This was back in the 1980’s and the northeast was suffering from an extreme depletion of striped bass due to over fishing. That meant that if you were not bottom fishing for flounder, sea bass or scup then you must be fishing for bluefish. And, that was the case on my first saltwater expedition. I caught one fish that morning and it was a fourteen pound bluefish that smacked a large Rebel minnow in about 10 feet of water. Since that day, bluefish have been one of my very favorite fish. Since the rebound of the striped bass fishery throughout the 1990’s, bluefish have certainly taken a back seat to the striper. Unfortunately, they have even being cursed and abused as a by catch to the royal striped bass. But, many anglers still enjoy pursuing blues simply for what they are. They are a tenacious, hard fighting fish that are more than willing to eat nearly anything you throw in front of their faces. To pursue bluefish successfully, you need to be able to adapt to different fishing styles based on the structure and water depth that the fish are holding at. Sometimes, you will find schools of fish feeding on the surface in relatively shallow water. This would be a perfect situation to throw surface plugs on spinning rods. Other times, you may find fish hanging on the down current side of a reef, holding in eighty feet of water. This would be a situation best addressed with a diamond or butterfly jig on a conventional rod. It’s best to get out there with someone who fishes your area to get ideas on the gear you need to fish your local waters. Fishing with bait is another popular approach. 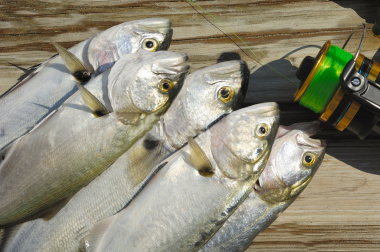 The east coast shorelines are teaming with menhaden, also referred to as bunker or pogy. They make for a preferred bait choice for blues. But, any local baitfish species will generally suffice. Bait can be fished either live or dead, though chunked dead bait usually provides the most solid hook ups. Since bluefish have razor filled mouths they will usually cut live bait in half and they rarely swim away with the half with the hook in it. Fishing with chunk bait allows you to regulate the size of the bait so the fish can easily fit the entire piece in its mouth. Be Aware!! Bluefish have extremely sharp teeth. Always use pliers or some type of tool to take out hooks. Concentrate on areas with good moving current around major structural points like jetties, rocks, river mouths and reefs. The current is sped up as water is pushed past these objects by the tide. This tends to disorient baitfish making it ideal hunting grounds for bluefish. It often helps to always have a spinning rod rigged and ready with either a heavy, silver spoon or a top water lure. Bluefish are notorious for creating feeding frenzies, or blitzes, on the surface of the water. A large school of blues will push a ball of baitfish to the surface of the water until they have nowhere else to go and the bluefish will attack them at the surface, creating a watery explosion. Fish after fish, all doing this at the same time creates an amazing site to see. Plus, the fish are striking at the baits so quickly that an angler can hook a fish on nearly every cast. It’s now funny for me to think that bluefish are considered such second rate citizens when they were the number one sport fish at the time that I first fished for them. Stripers certainly grow much bigger than blues. 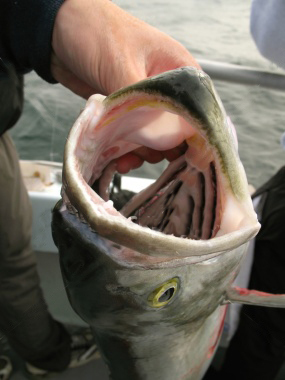 But, if bluefish DID grow as big as stripers do, there would most likely be another striped bass population problem. Bluefish will always be one of my favorite fish. Not only because they are so aggressive and willing to bite but also because they are the fish that got me hooked into the saltwater fishing world forever.